Saturday Super Villain, from Joel Marshall as part of the NTFS programme, is an episodic, rogue-style sequence of card battles complete with an amazing amount of character and variety. While combat is similar to a traditional card battler, it has an escalation system which gates tougher cards from being played until either combatant has raised the level to an equal or greater level than the card. This adds a degree of pace to the combat, however (when combined with the deck-customisation options which will be included in the final version of the game) it allows for players to optimise around quick, rapid and weak decks or slow but strong ones that boost escalation quickly. In this way, it gives each enemy and deck a similar depth and variety as in a fighting game. I played through the first episode of the game while at EGX 2018 and had a lot of fun, returning shortly afterwards to have another go at it. Joel Marshall, the developer working on the game, spoke to me about his plan for the finished game. Episodes were not to be like the recent adventure-game efforts, instead acting more like chapters. These double as rest points between runs, but also as a chance to customise your deck and upgrade your lab. 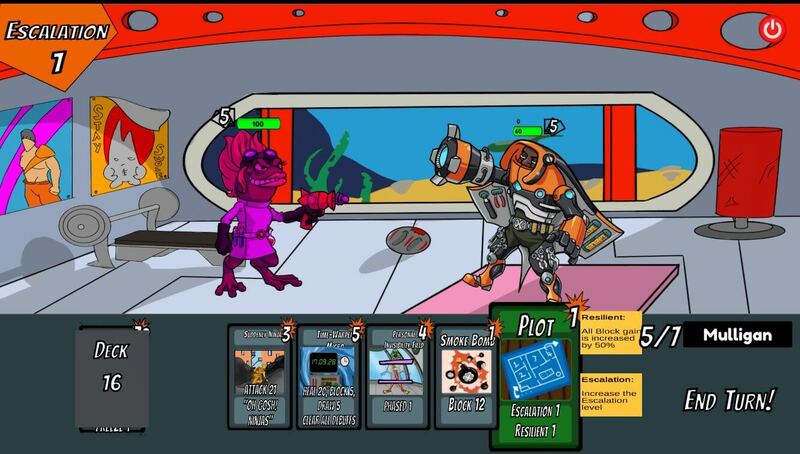 Saturday Super Villain is due to have a demo released on Itch.io soon, with a planned release on PC in 2019 and mobile to follow. You can follow the game on Twitter.